Castle Craig is a ruined tower house with elements of an associated enclosure, situated on the northern shore of the Black Isle, overlooking the Cromarty Firth (NGR: NH 632 638)(Figure 1; Plate 1 and 2). The site occupies a cliff-top spur, which affords views across the Cromarty Firth towards Alness and the hills to the northwest. Currently, the site is heavily overgrown, forming part of a densely vegetated scarp slope, between level arable fields to the south, and the shoreline to the north. An overgrown, signposted footpath leads past the castle to the shore. The aim of this assessment was to establish the historical, archaeological and architectural background of the castle site and its setting. It also aimed to define the archaeological research potential of the site and any archaeological constraints to historic site development, and to recommend appropriate further archaeological investigation and conservation action. 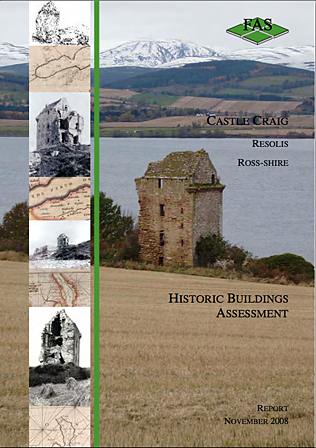 The assessment is divided into five parts: the statutory designations relating to the site; the historical and archaeological development of the surrounding area before the 16th century; historical evidence for the development of Castle Craig itself; the architectural and archaeological evidence visible at the site today; an assessment of the research potential and significance of the site.